A stay at Scandic Strand places you in the heart of Bergen, within a 15-minute walk of Bryggen and Hurtigruten Terminal. 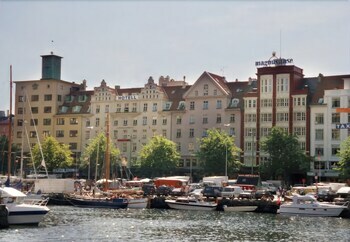 This hotel is 0.3 mi (0.4 km) from Kloverhuset Shopping Centre and 0.4 mi (0.7 km) from Den Nationale Scene. Make yourself at home in one of the 98 guestrooms featuring refrigerators. Complimentary wireless Internet access keeps you connected, and cable programming is available for your entertainment. Bathrooms with shower/tub combinations are provided. Conveniences include desks, housekeeping is provided daily, and cribs/infant beds (surcharge) can be requested. Make use of convenient amenities such as concierge services, shopping on site, and complimentary use of a nearby fitness facility. 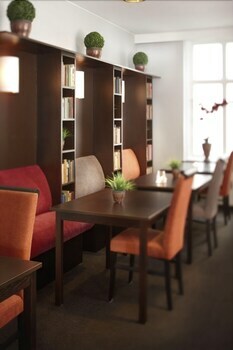 At Scandic Strand, enjoy a satisfying meal at the restaurant. Quench your thirst with your favorite drink at the bar/lounge. A complimentary buffet breakfast is included. Planning an event in Bergen? This hotel has facilities measuring 2615 square feet (243 square meters), including conference space.